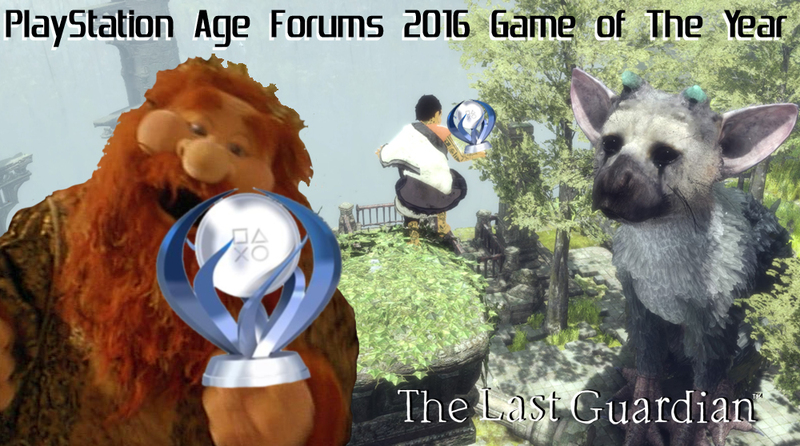 PSC » PlayStation Age Forums - GAME OF THE YEAR 2016 WINNER! Having recently completing The Last Guardian I feel it completely deserves the Platinum this year! I heard mixed things before going into it but as soon as I started playing it all them fear were set straight. The game delivers on a solid adventure story, in which a young boy and a wild beat must learn to have faith in one another and battle the odds of their imprisonment. I think what really makes the game stand out is the attention to detail but into Torico (That's what I call him as it sounds like what the boy calls him), He's by far the most believable rendition of an animal/beat put into a game ever. From his reactions, anticipation for feeding time, crying if you have to leaving him every little detail compiles to an astonishing presentation. I also found myself yearning for a game like this, which isn't falling into the Sandbox trend of this gen. I loved the notion of exploring these environments and using Torico to navigate them. It's a game I would sink into after coming home from work and just go at my own pace. I enjoyed just exploring the environments, for a gaem which is set in an abandoned ruin, there felt there was so much to see and look around. The mystery surrounding the ruins your imprisoned in are so compelling although out and the game really delivers making it so compelling through it's subtleties - Not just scattered notes thrown around the environment, but through its visual design. Obviously this game has been a long time coming, I am not sure if the creators delivered the experience they intended but to me it felt like a complete and remarkable experience and one which has really stood of in this generation for me. I agree with your assessment. While it came out late in the year, I managed to pay it and beat it before the end of December, so I felt comfortable voting for it. It was truly a beautiful and amazing game to play. The biggest criticism that I hear is that Trico doesn't always respond to your commands....... well of course he doesn't. He is an animal. The creators even told us long before the game was released, that he would often disobey or simply do his own thing. What exactly were these people expecting? I think I said this in the other thread, but if anything, I felt Trico was almost a little too responsive. I expected it to be much more difficult to control him. Anyway, I look forward to getting a second playthrough in sometime this year after I catch up on some of my PS4 backlog and maybe try to find all of the stuff that I missed. Maybe go for 100% of the trophies. Not sure about the speedrun trophy though. On a side note, I finally got a chance to play through Doom in the last week of December. I have 4 or 5 maps left to go in the main campaign. I can't believe how incredible this game is. It's probably the perfect blend of the classic style FPS (which I prefer) with just the right amount of modern FPS features added in. Another 2016 game that I would like to comment on was Inside. I got a chance to finally play it towards the end of December as well. As a HUGE fan of Limbo, I was looking forward to trying this game out once I finally got my PS4. I have to say that it was an incredible improvement on Limbo. It had a lot of similarities to Limbo. Somehow they managed to improve on everything in some way. Another great game with minimal story and dialogue, yet it really pulls you into the story. It obviously couldn't have been part of the game of the year competition, but it might have been interesting to have a indie game of the year contest. I would have voted for Inside for sure. I have been in and out of this forum and I didn't get a chance to vote, but I just wanted to chime in and say The Last Guardian completely deserves to win. I was a big fan of Ico and Shadow of the Colossus but the Last Guardian was even better than those two IMO. I originally bought a PS3 back when Last Guardian was first announced since I knew it was one game I had to have. But as we all know it kept getting pushed and pushed until it mysteriously disappeared only to re-emerge as a PS4 game and finally release. 8 or 9 years from announcement to release is a long time to wait and I hesitate to say it was worth that wait but it was an unforgettable experience. Easily my favorite PS4 game so far.